HOUSTON, April 15, 2019 /PRNewswire/ -- In a press conference today, local nonprofit housing developer Avenue celebrated officially breaking ground on Avenue Center , a new mixed-use community resource center in Near Northside. Construction was kickstarted by a $1 million gift from the BBVA Compass Foundation , which will create opportunities for Avenue's comprehensive homebuyer education and counseling programs at Avenue Center. 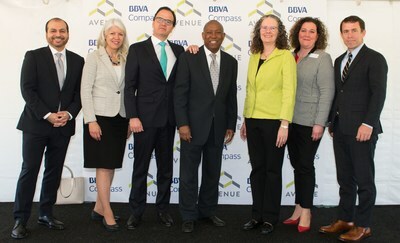 (Left to Right) BBVA Compass Director of Communications and Responsible Business Rey Ocañas, Houston City Councilwoman Karla Cisneros, BBVA Compass CEO and Country Manager Javier Rodriguez Soler, Houston Mayor Sylvester Turner, Avenue Executive Director Mary Lawler, Avenue Board of Trustees President Cassandra Silvernail, and Houston Housing and Community Development Director Tom McCasland at the Avenue Center groundbreaking press conference. A rendering of Avenue Center. For more information about Avenue's community development and revitalization efforts visit, http://avenuecdc.org/ . Avenue's mission is to build affordable homes and strengthen communities. The organization enhances the quality of life of working families and works to promote healthy, vibrant and economically diverse neighborhoods that are essential to Houston's future as a world-class city. Avenue develops homes for purchase and rent as well as provides homebuyer education and counseling to help working families buy and maintain their own homes. We promote economic development and offer supportive services such as computer labs, after-school programs, and nutrition, fitness, and financial literacy classes that enrich the lives of the individuals and families we serve. Avenue is a member of the nationwide NeighborWorks® Network of more than 245 community development organizations working in nearly 4,358 urban, suburban and rural communities across America. Connect with Avenue on Facebook: http://bit.ly/FBAvenueCDC and Twitter: https://twitter.com/AvenueCDC .